MVHR ( Mechanical Ventilation Heat Recovery Systems) ensure high air quality in domestic homes, commercial and industrial properties and help prevent condensation issues and mould growth. RB Grant supply & install heat recovery ventilation systems throughout Scotland for new builds as well as renovation projects. 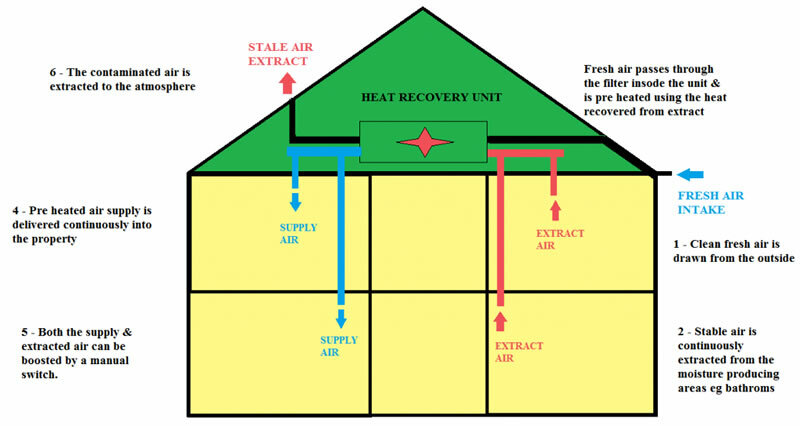 MVHR also plays an important role in conserving energy in buildings by recovering heat from extracted air and transferring it to the incoming air. MVHR systems are a great addition to Passivhaus buildings with great benefits for the overall energy efficiency of the property. warm and fresh filtered air. The ventilation system will remove condensation, pollutants, reduce dust and allergen levels; improving the air quality in your property. We install systems using a variety of manufacturers in both domestic and commercial buildings. We have installed MVHR systems for Fife Council, Angus Council and Fife Housing. MVHR system works by supplying and extracting air throughout the property. Stale air is extracted from moisture producing rooms. The heat from the stale air is recovered via the heat recovery unit and delivered into the other area of the property. RB Grant can provide a variety of ventilation systems for industrial buildings throughout Scotland and Fife. For more information on all the ventilation systems we offer see ventilation systems.